. . . Mr. McCain went so far as to condemn the collapse of the port deal, saying that Congress had served Mr. Bush poorly by not permitting a 45-day review of security concerns, though he did not mention that the deal was sunk by fellow Republicans. 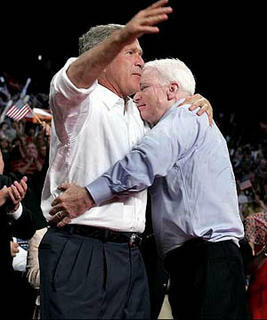 "The president deserved better," Mr. McCain said. 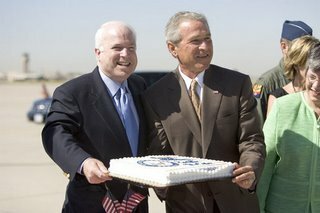 Mr. McCain praised the president for his failed effort to rewrite the Social Security system, said he supported the decision to go into Iraq and blistered at critics who suggested the White House had fabricated evidence of unconventional weapons in Iraq to justify the invasion. "Anybody who says the president of the United States is lying about weapons of mass destruction is lying," Mr. McCain said.